Excel G-lite Pro Lightweight Transit Wheelchair 20"
Excel Glite Wheelchair. 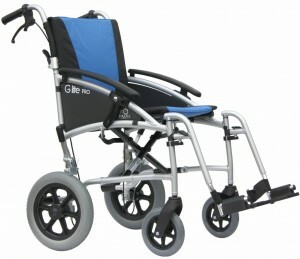 The Excel G-Lite Pro Lightweight Transit Wheelchair 20″ is based on the very successful Excel G-Lite transit chair. It shares many of the same great features, such as a ultra lightweight frame. However the Plus/Pro version has introduced an attendant braking system, to help make the job of the attendant even easier. The chair still has the standard parking brakes on the wheels, but the addition of easing brakes for the attendant makes temporary stops much easier, than having go down to the parking brake every time. It’s a simple chair and easy to set up, and just as quick to fold down to a compact size, making it easy to transport.